At a snapshot, it was a good scoring day. We played the tips. It is not a horrendously long course at 6816 yards. However, it played longer Monday due to the soaked fairways. There were also some really gusty winds, upwards of 30mph. We were seemingly surrounded by tornados, including an EF1 that did some damage over at the site of this week’s Byron Nelson. We finished the last hole just as the rain started to open up. There was a lot of good to take from this round. Particularly, I improved on things that plagued me just a week ago. 1) Par 5 performance. I was -3 on the par 5s. 2) Putting. I only missed one putt inside 6 feet. And it was a 5 footer. 3) Bounceback birdies. I birdied the very next hole on 3 of my 5 bogeys. 4) No doubles, no three putts (this is my goal every round, yet I don’t achieve it often enough). So there you have it. I’m capable of good golf, even in challenging conditions (wind, swamp). Need to take that same mentality into my tournaments. I still had demons standing over several putts, but I was able to clear the mind and put good strokes on them. The little bit of practice I have done is already helping. I made 93% of my putts inside 6ft. Below are my putting percentages on the season. I’m making roughly 40% of my putts in the 6-10 foot range. I’d like to see that improve. Scrambling. Looking at my scorecard, I was able to get up and down 4 out of 11 chances (remember that I consider any shot inside 70 yards as a chance for an up and down, not just those for par). That’s a 36% conversion rate. Pretty amateurish. In reality, 3 of those up and down opportunities were elementary. For example, I 3-putted off the fringe from 45 feet. Twice I had little bump and runs that I just got overly aggressive with leaving 8-10ft. The rest of the opportunities were more difficult. Even so, I convert those three and I’m shooting under par. I would be losing less than a stroke to the average PGA tour pro. I would have lost strokes in short game overall, except I made some great up and downs from further away to make some birdies on the par 5s. These missed up and downs largely come from rust. Lack of play. Just missing that extra bit of feel to chip / putt to 3-4 feet instead of 8-10 feet. It makes a big difference. I avoided any serious errors. Improved ball striking means no big errors. 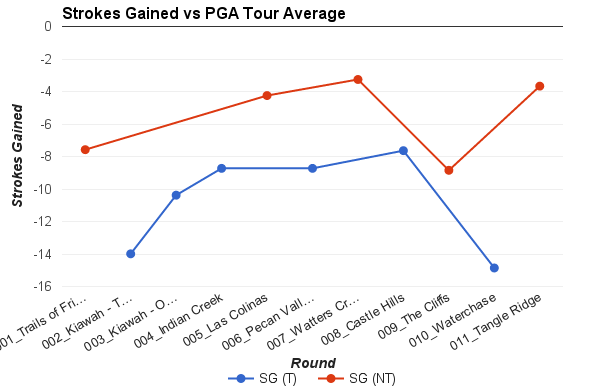 For starters, it is the second best round I’ve tracked in terms of strokes gained, in that I only lost a total of 3.67 strokes to the average tour pro. Only a 4x improvement on what I did in my last tournament! Scoring wise, it is obvious that I improved, but where did I improve the most? What am I doing better? The easy answer is… everything. I did everything better, or rather, more like I expect. I gained the most strokes in short game, however I explained how I still underachieved there. I lost the most strokes off the tee, which makes sense with the wet weather. I averaged 265 off the tee. Good, could be better. Above is a breakdown of where I am gaining / losing strokes to the average PGA tour player. Negative numbers are losing, positive numbers are gaining. 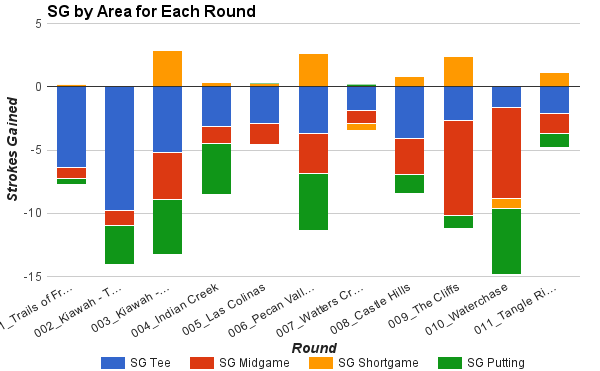 This data comes from a template I have built that crunches the information I get from Game Golf. 1) My short game has been consistently good. 2) My driving is improving (ie. its contribution to the negative is shrinking). 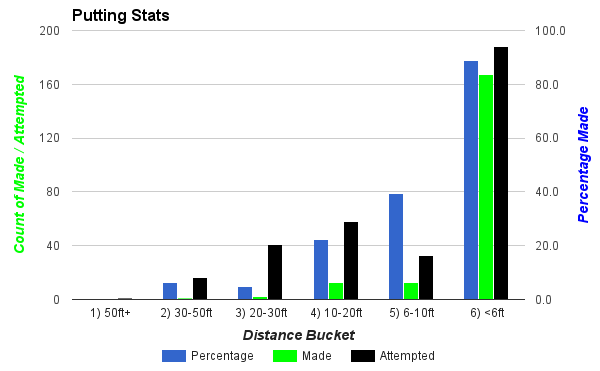 3) My midgame which had been solid, took a small dip the last couple rounds, but recovered to normal on Monday. 4) My putting varies from 1 stroke lost to 5 strokes lost. Needs more consistency. I see potential. I see improvement. I get to play a lot this week if the weather cooperates. A friendly round at Las Colinas Country Club on Friday and my next tourney is Sunday at Heritage Ranch. I won’t have rust as an excuse. Let’s hope I don’t have weather. The biggest positive was finally getting out with the wife and my pops. The Mrs. shot a 99 in her first round in a couple years. I need her to give me some putting lessons. It was fantastic to get some quality kid-free time together. Thank goodness for grandparents.